A few years ago, when I was writing Before Action I chanced on a discussion thread on the Great War Forum concerning the 9th Devon casualties for Loos. Someone was researching a man from the battalion killed in action on 30 September. He couldn’t understand how this fitted in with the uneventful day recorded in the War Diary. I registered this as an interesting question but not one I needed to answer just then. Coming back to it now, I find that it’s a much bigger question than it seemed. Atkinson’s history of the Devonshire Regiment lists all the First World War casualties by battalion, with names, dates and other details. He identifies a total of 120 men of the 9th Battalion killed in action or died of wounds during the time they were engaged at Loos. Save for a few individuals, the Commonwealth War Graves Commission records tally. So it comes as a surprise to find that in the chaos of 25 September, when the CO, his second in command, three of the four company commanders and.most of the subalterns became casualties, and when those who managed to get across the battlefield to Gun Trench faced shell and sniper fire through the day and a vicious counter-attack during the night, only five other ranks are supposed to have died. On the 26th, apparently, four men died; then two on the 27th, when the battalion was pulled back from Gun Trench; two on the 28th and three on the 29th. But on the 30th, when the battalion marched away to Beuvry in the early hours, the total shoots up to 105 men. The CWGC reduces the figure slightly, moving four of Atkinson’s 30 September casualties to the 25th, one to the 26th, and one ‘between 25/09/1915 and 30/09/1915’. That still leaves us with 99 men dying on a day when the battalion went out of the line. Two can be accounted for: they died of wounds and have known graves; 19-year-old Private Ernest Reeves in Chocques Military Cemetery north of Bethune, where there was a Casualty Clearing Station, and Private John Henry Watson at Etaples: he died in the hospital at Camiers. No mystery about them, but what of the other 97? All their names are on the Loos Memorial to the Missing, along with most of those said to have died on the 25th or the days following. There has to be a mistake here, but it’s hard to see how it happened. Easy enough to understand that in the chaos of the first few hours no one would have seen what was happening to any man not immediately in view. The scattered groups of survivors pinned down in Gun Trench for two days did begin to take stock, or try to, and a more comprehensive view was possible after the 27th, when they were all together. At Beuvry there would surely have been a roll call and lists of the missing would have been made. And maybe by then there would be a lot of men whom no one remembered seeing. But putting together all the accounts of what happened, from the official records to private letters describing individual experiences, it seems clear that most of the 97 would have died crossing no man’s land or in Gun Trench, on 25 or 26 September. The survivors would have known that and even if they weren’t sure which day a man died, why would they record an obviously wrong dat, the 30th? A simple administrative mistake, perhaps? The officer writing up the list at Beuvry on 30 September started with the date, 30 September, and someone at Brigade or further back took it to be the date of death? I’m floundering here… If anyone reading this knows the answer or has any better ideas, please say! For the next three days they remained in the line, moving forward to dig trenches or stand to arms when ordered. ‘We had stuck in Curly till Thursday in misery,’ Harold Rayner wrote, ‘being wettish, and the chalk mud awful. The men never complained and were splendid. We got no rations, and despite all, stuck it. The officers who came through were very popular with the men. I was plastered with mud. My tunic badly torn with wire, my fingers very tender from crawling on the ground, and my beard terrific.’ Finally, at 2.30a.m. on 30 September, their relief came and they began the march back through Vermelles and Noyelles towards rest billets in Beuvry, just east of Béthune. Through the afternoon of 25 September those members of the battalion who had managed to cross No Man’s Land were pinned down in two small groups, unable to move forward or back. Lieutenant Brindley’s party was in Gun Trench, north of the Vermelles – Hulluch Road; Captain Nation’s party had pushed ahead as far as the Hulluch Crossroads, south of the road. . .
At 12.45am Lieutenant Brindley sent a message to Brigade HQ. ‘The Germans have just attacked but were driven off without much difficulty though the troops on the right of HULLUCH RD left us in the air. Lieuts HODGSON & RAYNER & about 90 men are with me. Lt PRIDHAM & party of 25 has not returned from drawing rations. We shall want more S.A.A [small arms ammunition] & bombs, but cannot spare men to fetch them.’ Then there was nothing to do but rest, and wonder what the dawn might bring. Captain Nation had been left for dead at Hulluch crossroads. In fact, he was unconscious. The story told in his company for months after was that he had been bayoneted while in this state, but Major Anderson did not think so. ‘Poor N was badly wounded, (thro’ the centre of the body, from R to L I believe) and left for dead in a dug out,’ he told John Upcott. ‘His wounds were dressed by a German officer & he was not bayoneted but nearly stripped naked while unconscious.’ Nation came to in the early hours of the morning and, finding himself completely alone, managed somehow to crawl back towards Gun Trench, until he was seen by some of the 8th Devons who brought him in. By then he was failing fast. Smyth gave what first aid he could, and two of the Company volunteered to carry Nation back to their own lines, using a trench ladder as a stretcher. At 5.50am an intensive bombardment began. ‘What one chiefly noticed was not the noise but the steady swish of the shells passing by hundreds over head.’ This provoked German shelling in reply, which caused some casualties among the men waiting in the forward trenches. Then gas and smoke were released along the British line. At 6.25am, five minutes before the attack began, the rear companies of the 9th Devons, C and D, began to move forward along the trenches leading to the front line. As they reached A and B, so they too began to move. That was at about 6.30am, when the first wave of the attack emerged from the front line. There, in front, the scene was chaotic. The rear Companies of the 8th Devons advanced too quickly, leading to crowding at the prepared gaps in the wire – creating an easy target for rifles and machine guns in the enemy trenches. There was also gas in the air, the wind being too light to carry it away. A private in the 8th Battalion described the scene for a local paper: ‘When we got over the parapet we were met with terrible rifle and shell fire, gas and barbed wire. The enemy seemed to know what we were going to do. . . It was terrible at that point; I am sorry to say scores got killed just here.’ They did. The 8th Battalion lost all but three of its officers at this point, killed or wounded. What this meant to the 9th Devons, trying to make their way forward, was that as they drew nearer the front the trenches became increasingly choked with wounded from the Battalions that had already gone over. There were other hazards too. C Company was held up for an agonising 15 minutes when their machine guns became entangled with the telephone wires. The decision to give up on the congested trenches altogether and move forward in the open seems to have been made piecemeal. 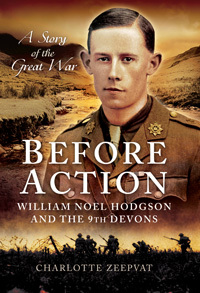 Noel Hodgson and the rest of D Company climbed out of Chapel Alley at the chapel of Notre Dame de Consolation, close to the Hulluch Road, at 7.45am John Upcott saw Alan Hinshelwood moving in the open and climbed onto the parapet of his own communication trench to get some idea of what was happening. He could see right across the battlefield to the village of Cité St Elie, far off behind the German lines, where shadowy figures were moving; who they were he could not tell. It was Major Storey who told him to take C Company out of the trench and across open ground. A stretcher bearer in one of the trenches signalled to him to have his wound dressed. He jumped down and was just being attended to when a shell hit the next bay of the trench, exploding an unused gas canister. Gas began to fill the trench; with only one hand useable, John Upcott was not able to put his mask on quickly enough. He took in sufficient gas to make him feel very ill, and a passing Chaplain set him on the way back towards Vermelles, and safety. Hodgson and his bombers had been called away to the left to help deal with a strongpoint in the German line, where they and bombers from the 2nd Borders took 150 prisoners. Rayner saw the prisoners being taken towards the British lines and felt an uncharacteristic surge of anger, knowing that these were the men who had caused so many casualties in the Battalion. He attended to a few of the wounded men close to him, made sure they had water bottles, and pointed them in the direction of the nearest Advanced Dressing Station. Then he paused to take stock. He thought he had about two to three dozen men of C Company with him, and some of B. Ahead of him he could see Noel Hodgson and Lieutenant Brindley, who took over, gathering everyone into a German trench the British knew as Stone Alley. Mervyn Davies was there too with survivors of D company, and Brindley led them into Gun Trench – a series of gun emplacements where eight or nine German guns had been captured by the 8th Devons and the Borders in the first wave of the attack. The bombers rejoined the party. At 10am, Hodgson led them in a reconnaissance through a communication trench leading towards Cité St Elie, to see if it was possible to advance further. But at Puits Trench, which encircled the village on the south-western side, they encountered a thicket of uncut barbed wire. So the survivors began to dig in around the captured guns. It may have seemed unnecessary when there were well-dug German trenches nearby, but it was the safest option. German gunners in the rear could range shells accurately on what had been their own trenches but they would avoid hitting the guns. Given a chance, they would recapture those intact.